This month the fun gang at the Secret Recipe Club have decided to do a themed reveal in the run up to Christmas - yup we're rounding up some amazing holiday treats. I almost missed out on this fun little event, but Sarah - our super awesome leader, kindly let me join in. I was assigned Camilla's blog - Culinary Adventures with Camilla. I've known Camilla as a blogger for a few years now - lovely lady with an amazing blog. She has two wonderful little helpers that make an appearance from time to time. 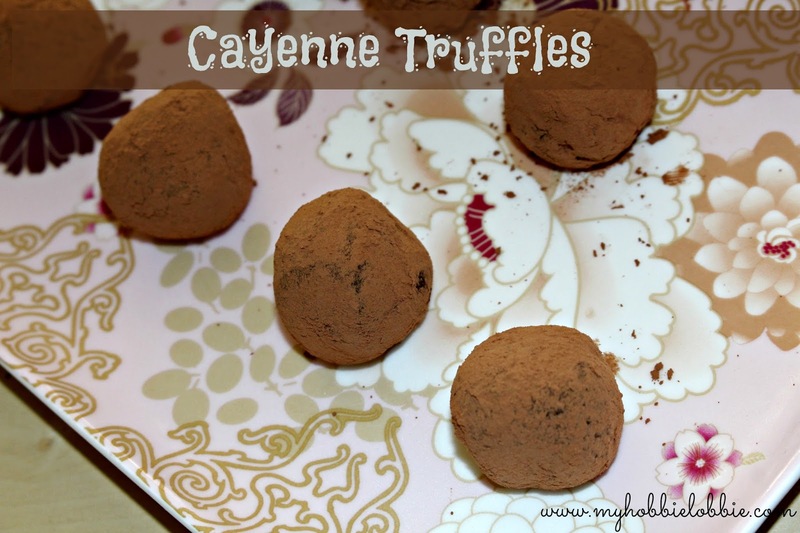 I decided to try out her Cayenne Truffles for this weeks reveal. It is a simple recipe to make with some stunning results. But if you live in Australia, be warned, do not make it on the hottest day of the season, like I did. I had a little trouble forming them because of the weather, so they may not look as good as her's did, but they were so tasty. The cayenne is not overpowering, but subtle and best of all, I was really pleased that I can now say I've made truffles at home. Thanks Camilla for a lovely recipe. In a small heavy bottomed saucepan, bring the cream to a simmer. Take off the heat, add the chocolate and the cayenne pepper to the pan and let it sit for about a minute or so and then stir together till everything has melted and mixed well. Pour into a shallow bowl and refrigerate for a couple of hours. Scoop out small truffle sized balls and place them on a plate and refrigerate till they firm up, about 15 minutes. Take about 2-3 tablespoons of unsweetened cocoa powder in a little plate. Roll the truffle mix into balls and toss them in the cocoa powder and ensure they cover the truffles well. Hottest day of the season? Are you kidding me? It's like 2 degrees F outside here. Brrrrr! Lucky! Love, love, love truffles. YUM! They look wonderful! Mmmm.. I have never made homemade truffles, but they certainly look divine! Thanks Jamie, they are super easy. 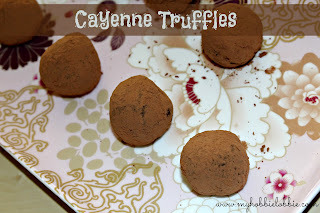 I love making truffles and sharing them, and the idea of adding cayenne, well, I have to try it. Great SRC choice. I'm so happy that you were able to join in the fun, Trisha!! I think I need to remake these this week. Thanks for sharing this recipe Camilla ... they were awesome! I love the idea of the cayenne with the chocolate. Sounds good. I love a little bit of spice in my chocolate. I think your truffles look perfect. Love the addition of hot spice! I knew from your recipe title that it had to come from Camilla's blog! Great choice. :) I love her blog .... Thanks Lauren!